It's rare for an author of such a perfect standalone novel to give the readers what they want: more information about the characters. 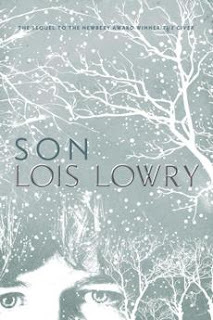 With the debatable ending of The Giver, Lois Lowry could have walked away and left us forever wondering if Jonah froze to death or if he really made it to a new community. It is a true gift that she followed up with Gathering Blue and The Messenger. And now we have Son, the final novel in the series. I adored Son: making connections between characters, learning more about the original community, and experiencing life from the perspective of Claire, a birthmother from Jonah's original community. The biggest treat of all was that Son is essentially three books, two about Claire and one about Gabe. Interestingly enough, my favorite was the second section, about Claire rebuilding her life. There are a few references to events in Gathering Blue and The Messenger, but they aren't required reading to be able to enjoy Son. It might actually even be fun to go straight from The Giver to Son, and not have to wait twenty years like the rest of us did! I wish the cover was jazzier, but then, The Giver doesn't have the most appealing cover either. I suppose it doesn't matter, because anyone who has read The Giver will be dying to check out Son.